The motor is a very simple device. The Assembly of the device takes less than ten minutes and cost no. But such work, especially if you study the device and the electric motor together with the children, very interesting and informative. - 0.3 meters of bare wire with a diameter of 0.8-1 mm. Start work on creating a motor with a winding coil. For this you need wire having enamel insulation. Wrap the wire in even turns. It is very difficult, so use a Foundation, such as a rechargeable battery. 5cm of wire at each end let free. Wind about 20 turns on used basis. The winding should not be very dense, but at the same time and too loose winding will not work. Remove the coil from the frame. Do it very carefully, trying not to damage the winding. Left free ends of the wire around the screw received in the winding of coils. This is to ensure that the coil retains its shape. The coils received in the winding, position accurately opposite to each other. About 1cm of the wire leave. These ends of the coil will be placed on the holders. 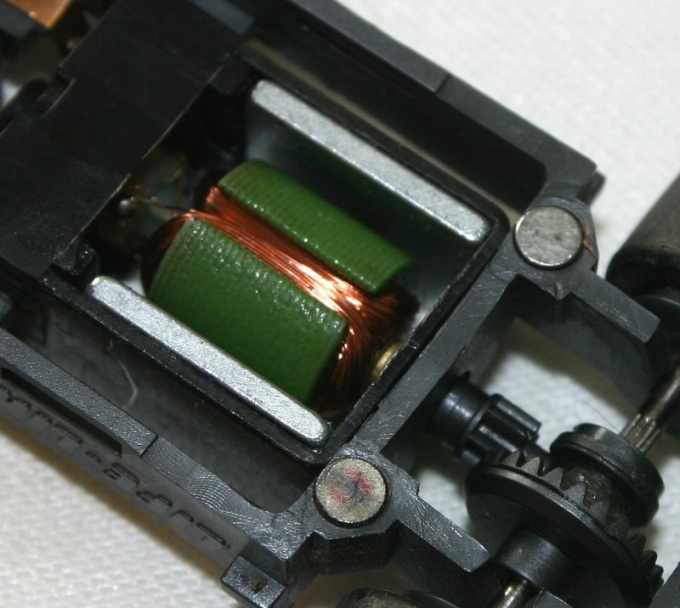 To improve the operation of the motor, strip the insulation at the ends of the wire from which the coil is made. There is a small trick. Remove the insulation from only one side of each of the ends. For example, only the upper half of the ends of the wire. The lower part should remain sasayakana. Most importantly, watch carefully so that the isolated region were on the bottom of both ends of the coil. Holders, on which is a coil, made of wire without insulation. Apparently they are a wire, bend in half with the loop. In this loop are to be inserted, retained by the coil winding ends. A piece of wire of length 15cm just fold in half, wrapping the middle around a nail. The base of the motor make a holder for the battery. It has a certain weight and will keep your engine from vibrating during operation. Now assemble the engine. To attach the battery holders. Insert it into the holder for the battery. Place the coil in the holder. The battery put the magnet. Coil begin to rotate? So everything is done correctly. If you want to stop the motor, remove the spool holders. So you opens the circuit and the engine will stop.